The Tour de France might be over but the racing most certainly is not. Next stop in the WorldTour calendar is the race graced by the best inflatables out there – yes it’s the Tour de Pologne. The 72nd edition starts this Sunday and sees the peloton take on seven stages as they ride south from the modern capital Warsaw to the historic one in beautiful Krakow. It’s a demanding parcours with something to suit every type of rider. In addition to the 17 WorldTour teams, there are two wildcard entries for CCC Sprandi-Polkowice and a Polish national team. The first three stages provide excellent opportunities for the sprinters before the terrain gets decidedly more mountainous towards the end of the week. Stage three is the longest at only 160km, so all should be ridden at speed with plenty of time for the sprint trains to get themselves organised. Of course there is always a chance for a breakaway artist à la Taylor Phinney (BMC) in 2013 or Petr Vakoc (Etixx-Quick Step) in 2014. On stage four it’s time to shake those climbing muscles out a little. However, most of the hilly terrain comes at the beginning rather than the end of the 220km route, meaning we should see another sprint finish in Nowy Sacz. It’s time for the grimpeurs on the next two stages, which each feature eight category one climbs. 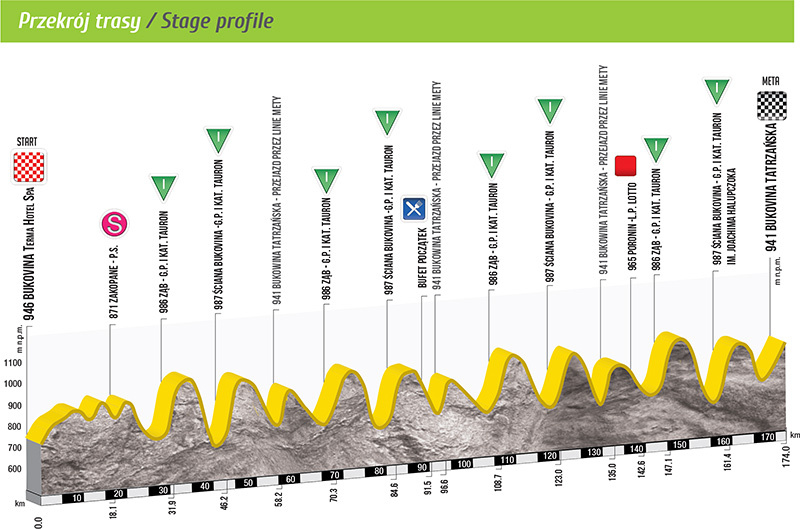 Stage five is the longest of the race at 223km, of which the first 81km is flattish. From there the riders enter a finishing circuit where they will tackle eight ascents in total: the hardest of which is the 4.2km Gubalowka with a maximum gradient of 18.4%. The final ascent summits at 13km from the finish before swooping downhill and thundering into a slightly uphill finish in Zakopane. 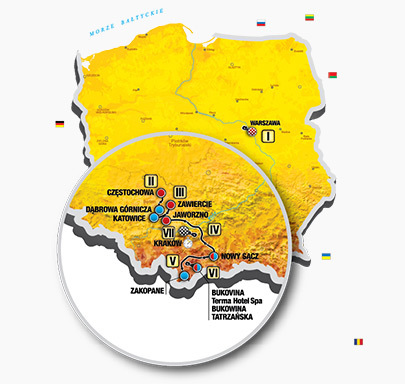 Stage six from Bukovina Terma Hotel to the finish at Bukowina Tatrzanska is identical to last year’s circuit-based route. Look at that saw-toothed profile: there is hardly a single kilometre of flat to be seen. The toughest ascent is the cat 1 Gliczarow Gorny, 5.5km long at an average of 5.7% with a ramp of 21.5% halfway. This is the only stage to feature an uphill finish. The 5km climb is uncategorised but with ramps of 8% to 11.5% it’s going to be a sting in the tail for weary legs. While the GC may take shape over the previous two stages, it won’t be settled until the individual time trial on the last stage. It’s a 25km flat route which most definitely suits the specialists and they should be able to make up any time losses over the mountains. It’s also worth bearing in mind there are bonus seconds on the finish line of every stage. The ideal candidate for the overall win is a one with a punchy finish and decent time trial. One rider that ticks both boxes is Movistar’s Ion Izagirre, runner-up in both 2013 and 2014. Third at the Vuelta al Pais Vasco in the early season and coming back after his post Tour de Suisse break with an excellent second place at the Klasika Ordizia last week, the Basque rider will be more than ready to take the top step of the podium this year. In fact I have a feeling Movistar could feature in the team competition given that they also bring Giro stage winner Benat Intxausti (third in 2014) and sprinter JJ Lobato. Robert Gesink (LottoNL-Jumbo) will be hoping to carry his excellent Tour de France form through to Poland. Usually more suited to longer climbs, he does have form over the short steep ascents as his 2013 victory in the GP Quebec testifies. If he can mix it with the best on the climbs, he may be able to hold on in the time trial for a podium finish. Last year’s winner Rafal Majka (Tinkoff-Saxo) will not be at the start line to defend his title so Polish hopes will rest on the shoulders of Michal Kwiatkowski (Etixx-Quick Step). On paper this parcours is tailor-made for him, but we’ll have to wait and see how well he has recovered after his tearful exit from the Tour. Another home rider to watch out for is Maciej Paterski (CCC Sprandi-Polkowice). If he can match his performances in the hilly classics (second at Volta Limburg, ninth at both Amstel Gold and Brabantse Pijl) a stage win could well be on the cards. With four flat finishes every team is coming with a sprinter in hopes of an all-important WorldTour stage win. Sacha Modolo (Lampre-Merida), Andrea Guardini (Astana) and Giacomo Nizzolo (Trek) have all taken victories this year, and of course all eyes will be on Marcel Kittel as he makes his comeback for Giant-Alpecin. However, my fast man to watch for is Orica-GreenEDGE’s neo-pro tyro Caleb Ewan. Second at the Australian national road race and stage wins galore at the Tours of Langkawi and Korea, he’ll be raring to pit himself against the best at Poland.